Long before post-internet aesthetics and ubiquitous networking began to overhumanize technology, men in gray flannel suits were the standard metaphor for the dehumanizing nature of corporate technocracy. This expression, which swiftly became vernacular, stems from a 1955 novel by Sloan Wilson, The Man in the Gray Flannel Suit, describing the search for purpose in a pre-digital context amongst those who perceived themselves as just an organic extension of managerial structures. “Post-Information,” Thomas Locher’s current exhibition at Silberkuppe, in Berlin, is all about men in gray flannel suits—or rather, their absence. Information and communication theory treat human psychology as a servo-mechanical analogue—a comparison introduced by Norbert Wiener. A servo (short for servo-mechanism) is an automatic device that uses error-sensing feedback to correct the performance of a mechanism. As Niklas Luhmann puts it, “humans cannot communicate, only communication can communicate.” In systems theory, agency is a property that only emerges at the macro level, out of the combined action of all individual parts. Society, as a whole, is thus endowed with the volition that system theory denies that individual human actors possess. But since systems are operationally closed, a system has only its own operations at its disposal in order to form its structures. The only thing a system can will is to self-reproduce; communication is thus an operation that continuously replicates itself. In Politics of Communication, corporate space appears to be fully determined by these rigidly choreographed communication protocols. Most of the text captions are descriptive rather than prescriptive, but even as descriptions, they seem to fit the operations of a recursive algorithm rather than those of a human society, where the determining factors of structure formation are hardly internal to the structures themselves. 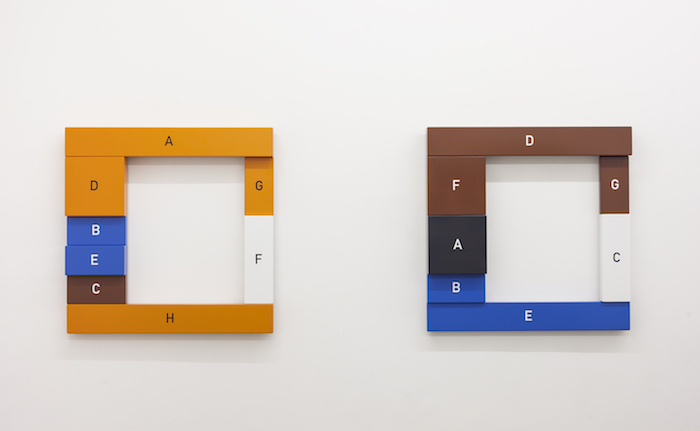 This programmatic character is echoed by another series on display in the gallery’s front room, A–G and A–H (2002-15), two frames mimicking floor plans, and by A.1—Z.2 (1989), a large-scale spreadsheet with all the information blanked out. Locher’s artistic career—which spans several decades—can perhaps be best described as an attempt to de-naturalize meaning. His work is methodical and analytic (rare qualities, at present, when most artists tend to pictorialize everything). Forcing the viewer to undergo a deadening process of redundancy and repetition, the artist points to the slippage between “coercion from within” and “coercion from without” in the rhetorics of management—whose purpose as a social technology, as Locher makes increasingly apparent, is to strengthen integration and to implement corporate discipline rather than to convey information or promote communicational exchange. (1) Niklas Luhmann, “How Can the Mind Participate in Communication?” in Materialities of Communication, ed. Hans Ulrich Gumbrecht and Karl Ludwig Pfeiffer (Stanford: Stanford University Press, 1994), 371. (2) Otto Mayr, Authority, Liberty, and Automatic Machinery in Early Modern Europe (Baltimore: John Hopkins University Press, 1986), 139-140.